When it comes to entertainment, streaming is becoming more popular. And for good reason: It’s usually cheaper to pay for an online streaming service than it is to pay for cable or satellite. Many households have broadband Internet, regardless of their TV entertainment choices. This means that the Internet connection is going to be there anyway. If you could pay a few dollars a month for access to TV and video on top of your Internet, rather than the scores of dollars each month required for cable or satellite, wouldn’t you? This is why streaming is becoming so popular. And in the streaming world, one of the big battles is Amazon Prime vs. Netflix. 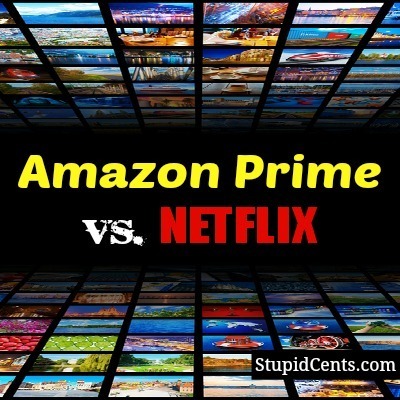 Amazon Prime vs. Netflix: What Do They Offer? First of all, there isn’t a big difference in price between Amazon Prime and Netflix. If you get the streaming-only package from Netflix, it costs $7.99 per month. Amazon Prime charges an annual fee of $79, which works out to $6.58 per month. So it is a little bit cheaper, but it’s not a deal breaker. Both services offer streaming through most entertainment devices, including computers, mobile devices, and gaming consoles (like the PlayStation and xBox), so it’s possible to use what you already have. No need to buy new equipment. Where there is a real difference between Amazon Prime and Netflix is the way the companies provide their offerings. First of all, it’s important to note that Amazon Prime is about more than just streaming video and TV shows. Amazon Prime also provides two-day shipping at no additional charge, and access to the Kindle Lending Library. So there are additional perks with Prime. One of the drawbacks to Amazon Prime, though, is that you often have to pay to rent newer movies and TV shows on top of the yearly fee. So you pay your $6.58 per month, but you might pay between $1.99 and $4.99 to rent a movie or an episode of a TV show. So the cost can start to climb. With Netflix, you pay the streaming fee and that’s it. You can watch whatever you want, whenever you want, and you can always easily pick up where you left off. With Amazon, the show expires within a certain time period, so if you don’t finish watching something, or if you forget to start watching something after renting it, you could be out the money. Netflix also seems to be moving more toward TV shows. Movie distributors and studios have started placing restrictions on Netflix regarding when it can start renting out movies (wait 30 days after its video release), so Netflix is looking at original programming and offering TV series. Amazon Prime also offers some original programming and TV shows, but the per-episode charge on some of the offerings can get annoying. Amazon Prime also has a wider selection of newer movies for streaming — but you have to pay extra. Netflix has a wider selection of older movies, indie productions, and documentaries. The main reason to keep paying for cable or satellite is if you really, really, really want access to premium channel shows immediately. You have to wait for some of these shows to appear on legal streaming sites, so if you want instant access the day they air, neither service will suffice. The reality is that most people choose to get the best of both worlds. The Amazon Prime vs. Netflix battle is a little misleading, since the two have differing strengths, and you can take advantage of both Amazon Prime and Netflix for less than $15 a month. Even paying for both, you’re still winning out over cable or satellite. While you’re at it, you might as well add Hulu Plus. For less than $25 a month combined, you could pretty much get all of the advantages of cable or satellite at a fraction of the cost. My latest post is about how I want to spend some time looking this year at whether we could cut cable. Thanks for this info, it’s very timely. The biggest two restrictions I see so far are the lack of sports programming and the fact that watching recent TV would require watching commercials (through Hulu Plus). I wish they would offer access to the shows, then allow you to pay a small fee to bypass the commercials on each individual show should you so choose.